The Selfie Drone is deemed to be an easy-to-fly camera which will enable one to share “dronies” instantly to a social network of your choice. Just how large is it? Well, it is roughly the size of a Belgian waffle, where the novice flyer will be able to enjoy a 12MP shooter with an accompanying flash just in case there are some low light conditions that need to be looked into. This Selfie Drone is more than capable of capturing Full HD video (1080p resolution) without missing a beat, and it delivers smooth operation with mechanical stabilization. The best part is, all of its intricate parts can be controlled from a smartphone. You are now able to take a group photo with family or friends in an easier manner than ever before, and the best part is this: no longer do you need to learn how to master the selfie stick — as you have now upgraded to that of the selfie drone. 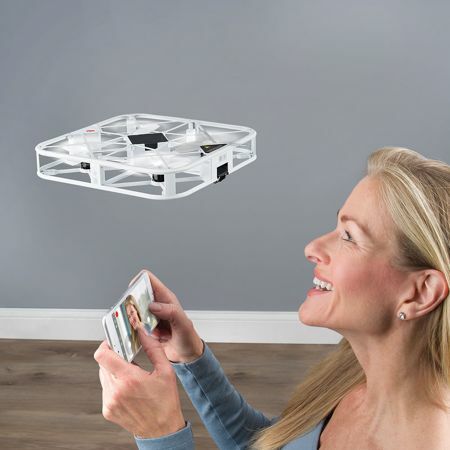 The Selfie Drone is capable of taking off or landing from your hand, in addition to having a working range of 98′ which should be far enough to capture even the largest group selfies ever. IT even comes with obstacle avoidance to create a stable flight path for this flying tripod. There is a microSD card slot to stash all of the recorded photos and videos, and it features a free iOS/Android app to work with.